It rained all day. Roads got muddy. Sky were gray. April. A cold rain. Not the kind to spend the day in. Not a summer rain that ends in sun. At night, after the rain stopped, it froze. Mud got icy. I walked to the river. It ran high. Water gushed under the bridge and under the extra culverts installed a few years ago. Spring rains would flow over the road. They don’t now. They flood the field on the other side. The fields all along the river were flooded. Shallow ponds formed. Geese and ducks swam and fed. They avoided the river. It flowed too fast. I tried to see what kind of ducks they were. I saw some mallards. The rest hid behind vegetation. Despite the rain, song sparrows kept singing. I could not hear them as well as other days. Rain muffled their songs. I had a hood on. My boots sloshed on the road. A phoebe, finally back for spring, tried to sing as well. When I turned back, rain hit my face. There was not much wind, but I walked into it. I pulled my hood lower. Rain fell harder. I looked down again toward other flooded fields. A kestral perched on a leafless ash tree. Its feathers were soaked. I would say it was not perturbed but it seemed to be waiting. I walked past. I hung my rain jacket to dry. I listened to rain pelting the roof. The lawn, not yet really awake, oozed. Snow lingers in the shadowed spots. It won’t last long. I picked up a book and disappeared. We’ve got Camel’s Hump and the waxing moon and a little snow and blue sky, not to mention 41 degrees. That is your fine spring scene for you. The road was a bit muddy–really muddy on the edges. I got sucked in a bit when I was forced over by a passing truck. No matter–I cleaned off my boots in the grainy snow. I walked out to get some air and to see what I could see. The afternoon was stunning, I tell you. I unzipped my jacket. I took off my gloves. I watched a red tailed hawk soar out over the fields and catch dinner. I was feeling pretty good. At the river I stopped and examined it for a bit. 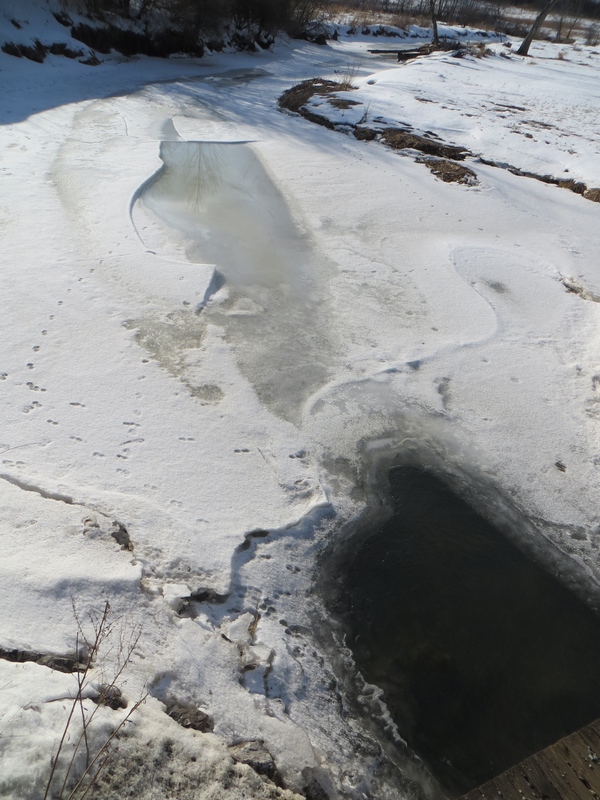 I saw lots of ice with water pooled on top, animal tracks criss-crossing the wet snow on the surface, and just a small area of open water. Soon there will be beavers and mallards and kingfishers here. 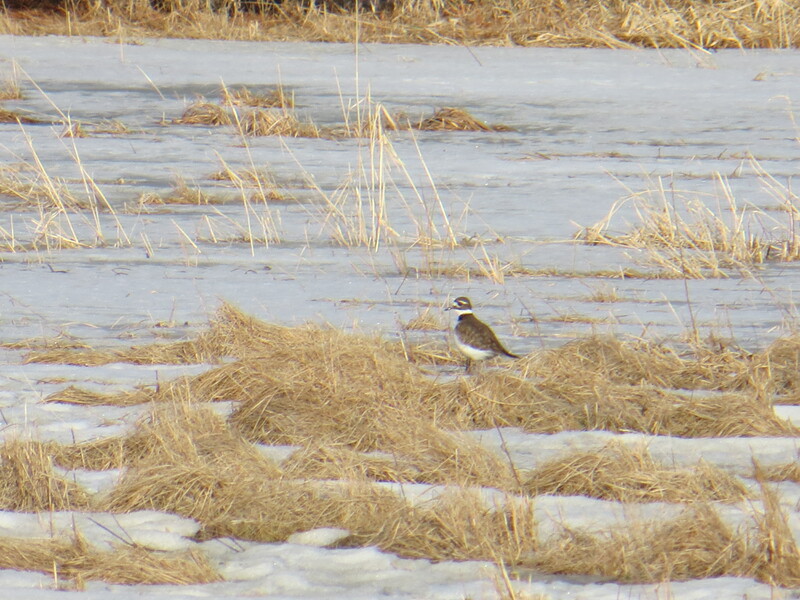 Almost back to the house and I heard something I haven’t heard since fall–the echoing call of a killdeer. I thought I might have been mistaken. Perhaps it was just a robin behind some trees, the sound twisted by the landscape? So I listened. I heard it again. Then I spotted it way out there–white and brown moving against the white and brown. I tromped over the snow and ice and dried grass until I got close enough to see it well. Then I heard another and spotted that one, too. Then another. Now that is a sign that spring is just about here. Tomorrow it is forecast to snow. A lot. We might get a foot or more by the time it stops. The annual battle between winter and spring seems to have begun. We will enjoy the snow–sledding, skiing, digging. I imagine the snow will not stick around long. Then we will enjoy spring. Winter and spring both offer a lot to amaze me. I can’t go wrong this time of year.